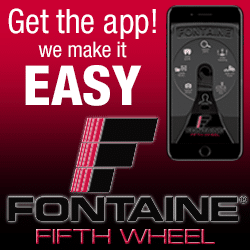 The new Fontaine Fifth Wheel App makes it EASY to find the fifth wheel parts and info you need. Fontaine is the only manufacturer to offer No-Slack® self-adjusting fifth wheels that eliminate slack between the kingpin and the lock automatically. This important benefit pays off big for our customers with improved durability and reduced maintenance cost. The new Fontaine app makes it EASY to get the fifth wheel info you need to keep your fleet running at peak efficiency.